Once every 5 years, when general elections come round, we’re given the opportunity to research the experience of voting. Although voting is not something we’re really working on, the recent general elections offered an opportunity impossible for the GDS user research team to resist. With some help from colleagues in the Home Office, we conducted a small study in the days before, during and after the general election. Our goal was to see if there were opportunities to make the voting experience better. 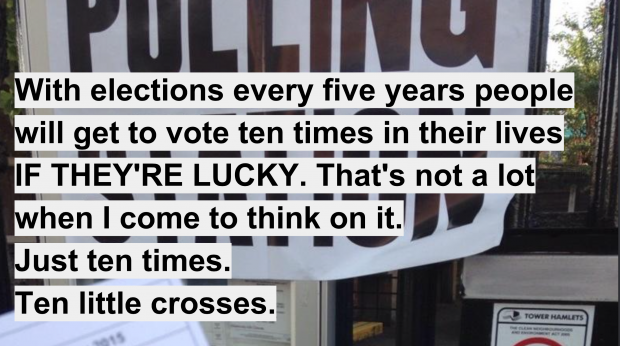 30 phone interviews with young people who were mostly voting for the first time. We spoke to them the day after the election. 44 participants from a varied demographic participated in a diary study using dScout. We triangulated the data from these 2 studies with data that our social media team found using Brandwatch. We were recruiting during Purdah (the pre-election period) and without a budget, both of which were significant constraints. As a result, the participants in our study skew towards being more engaged in the democratic process than we’d expect to be typical. Still, we think many of the findings are widely applicable, although you’d probably unearth a lot more opportunities and insights if you did the same study with less democratically engaged participants. Young people told us that casting their first vote felt like a rite of passage to adulthood. They felt compelled to vote because of the history of sacrifices made to be able to vote, and how hard-won democracy can be. Many people talked about the act of voting as feeling historic, and an important moment for them and their participation in society. Some people interpreted the paper and stubby pencils as signifying the ‘tradition’ of voting, but many others felt that the experience of voting was quite antiquated. The general elections are a moment in time where people are more engaged in their community and in the democratic process than they might normally be. This may offer an opportunity. People are looking for voting to be more of an experience, but the experience often turns out to be a bit of a non-event. Many people are surprised at how little time it takes to vote. On the one hand, they feel this should be communicated more widely so that more people know that voting is not time consuming and difficult. On the other hand, they sometimes feel ‘rushed through’ and the importance of the act of voting is lost. Several people felt confused and intimidated by people wearing rosettes and asking for their polling number. People taking exit polls don’t identify themselves, or what they’re doing, leading some people to mistake them as polling officials. For some people, this made the voting experience more stressful. For people who do want to vote, making sure you’re registered to vote is not always simple. Most people we spoke to were registered to vote, but they told us about friends and family who were not aware that they needed to register until it was too late. The need to provide your National Insurance number when registering to vote is more difficult for young people - they don’t receive a physical card with their number on it, so it’s more difficult to provide that information. Some people indicated that they weren’t sure whether they were successfully registered to vote, or where they were registered. This meant telephone calls to local authorities, which often went unanswered as the election drew closer, and people re-registering just to be sure. Moving house or having two addresses (eg students) was particularly problematic. This meant that some people delayed registering to vote until the last moment because they weren’t sure where they were going to be at election time. Or, sometimes they’d discover that they were enrolled a long distance from their current address. People use polling cards to confirm they are registered to vote, to know when and where to vote, and to find the polling station. Polling cards were a point of failure for many people, especially as they seemed to arrive at different times or not at all. They were often misplaced because they’d arrived very early, or caused stress because they arrived very late or not at all. Also, the polling station map on the cards seemed to be unreliable. Most people we spoke to took the decision as to who they would vote for quite seriously. Most of them struggled to find information that was useful to help them make a decision. Many people told us that they used the online tools that anonymised the policies in the manifestos and then told them who to vote for. They found these tools useful. People weren’t happy to discover new candidates in the polling booth at the moment of voting. Young people told us that they talked with each other openly about who they were going to vote for and who they did vote for - they’re aware of this being more of a taboo for their parent's generation, but feel that talking openly was an important way to help them decide who to vote for. Young people in particular thought there was a lot that government could be doing to help more people feel more confident and knowledgeable about the process of voting. A lot of people felt they learned about voting in the polling station when it should have been taught at school. People also thought that the government should be more proactive about messaging people to remind them that the election was coming up and when and where they should plan to vote. Less consumption of TV and newspaper content seemed to mean that it's more possible for young people to not notice there is an election coming up. A number of people were registered to vote in locations where both the general and local elections were held at the same time. For two main reasons, this often caused confusion. First: the focus on the general election often meant that people were not aware that the local election was being held and had not considered who to vote for. Second: there are different methods of voting for each type of election. This caused some confusion and people felt they had to be careful about voting to ensure their vote was valid - some weren’t sure that they had in fact voted successfully. Voting is very local - you can only vote in one location where you live and you vote for local members who represent that area. Many people found this difficult to understand and frustrating. The requirement to attend a single location to vote is a point of failure for people who intend to vote but aren’t able to be in the correct place on the day - they often don’t know this sufficiently in advance to arrange for alternative ways of voting or don’t know that other methods are available. To some people, this seemed particularly unnecessary and archaic and is often an unexpected discovery for people who are voting in the UK for the first time. People were often very frustrated that the local representation limited their ability to vote for the party they wished to represent. Most people seemed to think about voting for a party rather than for a particular Member of Parliament - a mental model that’s perpetuated in the way the media talks about the election - then they arrive at the polling booth to discover they can’t vote for their party of choice. This is a frustrating and disenfranchising experience. Finally, people who lived in safe seats felt that their votes were much less valuable than those who lived in closely-contested seats. So, it turns out there are lots of opportunities to make the voting experience better, which will in turn result in more people voting in a more informed way. You can download the deck for more details. We hope you find it useful. Just commenting in support of some of the feedback you gathered. Being in the UK during the last election (2010), but usually living in Australia, we found the experience quite bizarre with mid-week voting and a designated polling place. In Australia we have Saturday voting (making it easier for more people to get to a polling place) and the ability to get your name marked off the electoral roll at any polling station within your electorate. You are also able to cast an absent vote at any polling station in the country if you're travelling on polling day and you didn't cast an early vote or register for a postal vote. Many polling stations also use the opportunity for fund-raising BBQs or cake stalls for the local school (common polling places), making the event a bit festive.